It is one of the temples built east and west across the castle wall to protect the city in 796, two years after the shift to Heiankyo. , It was registered as a world cultural heritage in 1994 . Kukai, who had been spreading Shingon secular religion, turned to Toji Temple from the Emperor Saga in 823, and made the temple name the root dojo of Shingon Confucianism as " Kyoougokokuji Temple". Toji were destroyed by the war in Genpei, which lasted several years after the end of the Heian era (1180). During the Kamakura period, shrine hall, which were restructured with the help of Minamoto Yoritomo, was destroyed again in the Muromachi period. Many of the buildings found in the current Toji Temple were built afterward, with the arrangement of the pot at the time of foundation. Toji Temple is said to be a treasure trove of esoteric art and holds many national treasures and important cultural properties. In the building, the main hall, the five-storied pagoda, the large temple hall and the lotus flower gate are designated as national treasures. 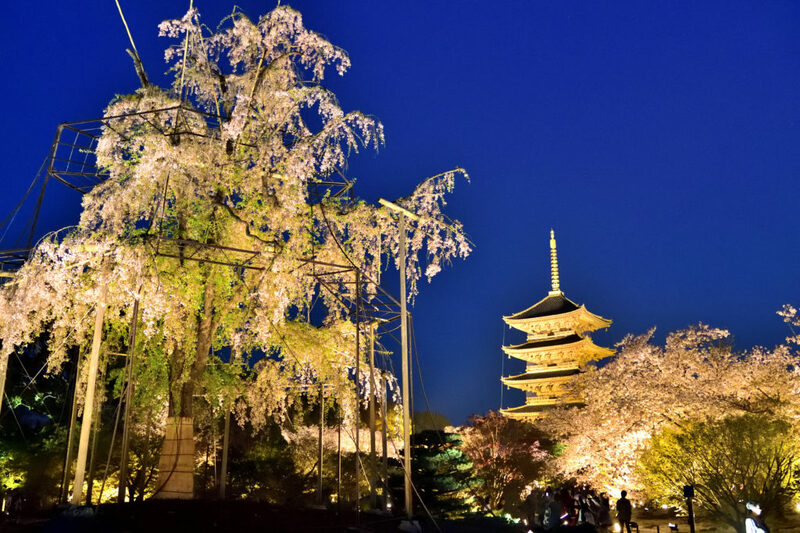 The popularity of cherry blossom light up at To-ji Temple is increasing year after year. If you want to see the cherry blossoms in the beautiful “blue hour” that the sky after sunset is dark blue, the aim at the east side gate along Omiya Dori, which is the entrance when lighting up, and line up 30 minutes before the start of lighting up. Alternatively, if you arrive around 20 o'clock, the place will not be relatively crowded. The five-storied pagoda can be said to be a typical scene of To-ji Temple, or even Kyoto. The five-storied pagoda of To-ji Temple, which can be seen from the train window of the Shinkansen, is approximately 55 meters high, and is the highest in the country as a extant wooden tower. The five-storied pagoda of To-ji Temple has been lost for the past four times due to lightning strikes, but many predecessors have been rebuilt each time. The present one is the fifth generation, which was rebuilt in 1644, and it seems to be in the same position as at the time of its founding. You can see it from various places in the town of Kyoto, but it will be best view when you look up at the footsteps! Although the inside is usually private, only the first layer may be specially published on New Year's Day etc. “Dainichi Nyorai” is enshrined in the first layer. It is “Kondo”, a national treasure building built near the central south of the precinct. Inside, there are Buddha statues, such as Nikko, Gekko Bodhisattva, and the statues of the twelve gods, centered on the Yakushi-nyorai. In the northern part of the kodo hall there is an auditorium designated as an important cultural property, and it is characterized by its amber columns. Inside, a total of 21 Buddha statues are enshrined, centered on the Dainichi Nyorai, and the esoteric world called a three-dimensional mandala is represented. On the east side of the auditorium and the main hall, there is an excursion garden centering on the pond. It is also a must see cherry blossoms reflected in the water of the pond. This garden with a pond, also known as Toji Garden, has many varieties, and it is a great attraction since you can see from Kawazu cherry blossoms in mid-March, Somei Yoshino, Edging Cherry blossoms, and double cherry blossoms. In addition to cherry blossoms, there will be a series of flower relays, such as azaleas, peony and flower buds. Kyoto Station: From Hachijo-guchi, walk 15 minutes west of Hachijo-dori to the left is the north gate of To-ji Temple. ※ The light is up at the east gate. If the waiting queue is long, it may be better to get off at the bus stop Kujo Omiya on the south side. Parking lot: You can park 50 cars with 600 JPY for 2 hours. Please confirm the latest information on the official site etc.